Male 3dot (Lochlann) hatched in mid-April on the island of Leka c190 kilometres north of the city of Trondheim in west central Norway. Lochlann was collected from a nest on a steep 20m cliff only accessible by rope on Leka by ornithologist Steiner Garstad on 18 June and temporarily housed at our holding site in a converted barn in Stjørdal only five minutes from Vaernes airport where it was cared for by Tom Roger Østeras. On 24 June Lochlann weighed 4.5 kilos and was estimated to be 10 weeks old. On 26 June Lochlann was flown from Trondheim to Kerry along with 21 other eaglets and was housed in a large cage in Killarney National Park with another Hitra female. On 31 July we attached PVC wing-tags (white on right and sky blue on left) with the symbol 3dot and a solar-powered GPS satellite transmitter. The 70g solar PTT-100 from Microwave Telemetry takes GPS fixes every hour during summer daylight hours with the data transmitted to Argos on day 3. The number of hours the transmitter operates is reduced in autumn and winter to save battery power during the shorter days. 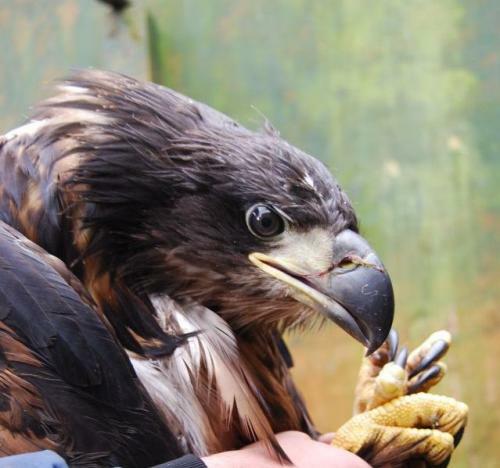 On 4 August Lochlann was released along with eight other eaglets. Over the next few days he moved over a short distance along the shore of Lough Leane where he soon found one of the feeding sites provided for the young eagles to help them survive the first 1-2 months after release. The name Lochlainn is Viking in origin ('place of the lakes') and the name Lochlannach was given to the Vikings and their descendents that remained and/or married with the native Irish after they were defeated at the battle of Clontarf (1014). As he came from a nest in the fjords of Norway and was released near the Lakes of Killarney, Lochlann seems an appropriate name! For some more history on the origin of the Lochlannach check out this webpage www.ucc.ie/chronicon/ocorr2.htm where Donnchadh Ó'Corráin argues that the word describes the Viking Scotland and not in fact Norway. Whatever the origin you can follow the movements of Lochlann (the eagle) on this website whether he stays in Kerry or visits other parts of Ireland or even Scotland as other White-tailed Sea Eagles have done!